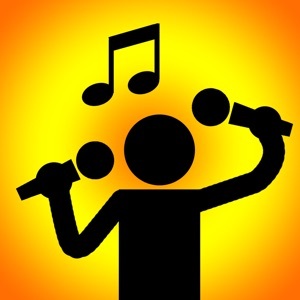 This is an app to practice karaoke using songs in your device's music library. You can practice it carefully with songs taken from iTunes purchased music and music CDs. It is convenient to practice difficult phrases. Let's master new songs earlier than anyone else. 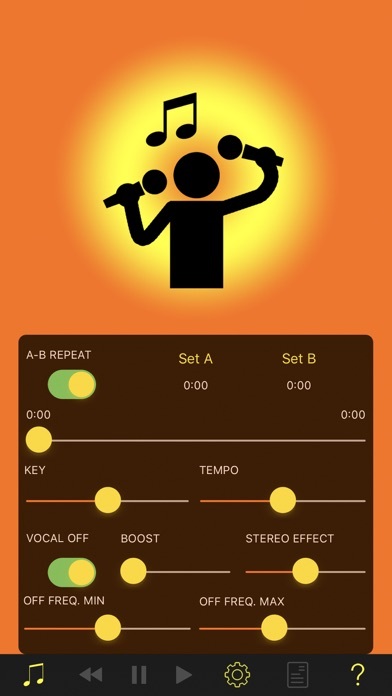 - You can practice the following · Practice by removing vocals · Practice harmony part by removing vocals · Practice by slowing the tempo · Repeated practice of A-B section · Practice according to your key · Search the lyrics by Web View · Practice even offline - Features · Vocal can be removed and played. 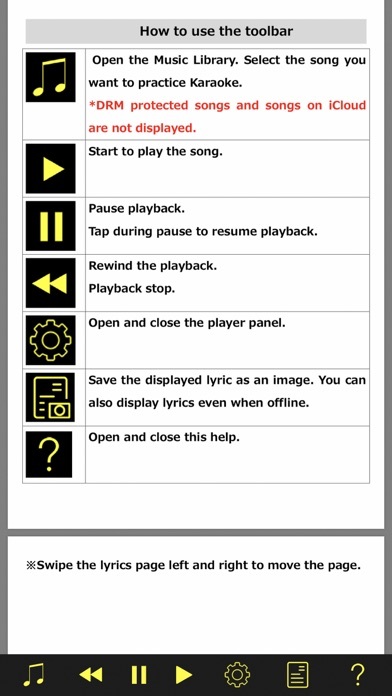 · You can change the playback tempo. · You can change the playback key. - Repeat playback can be performed by specifying an interval. · Lyrics can be searched by Web View. 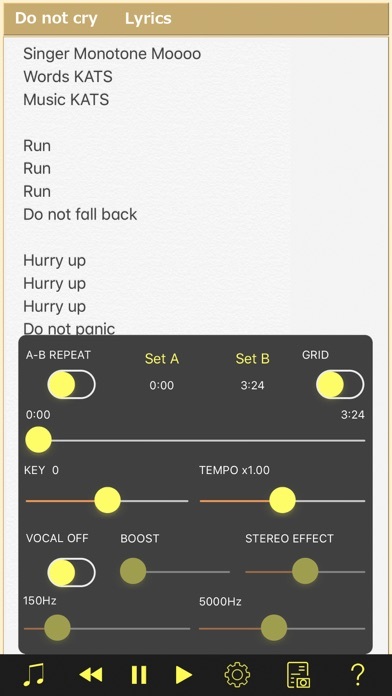 · Capture and save lyrics automatically. · You can display lyrics saved offline. -Configuration · AB repeat setting: ON / OFF, interval specification · Song Pointer: Moving by Slider Control · Key: 1 octave to + 1 octave and in semitone units · Tempo: 10% to 500% · Vocal removal: ON / OFF - Settings when removed vocals · Boost: Amplifies the volume dropped by vocal removal. · Stereo effect: In addition to general center cancellation processing, vocal elimination is a unique process to suppress midrange. Mixing the two will create a stereo effect. • Vocal elimination frequency range: Sets the lower and upper limits of the frequency range that suppresses the midrange. 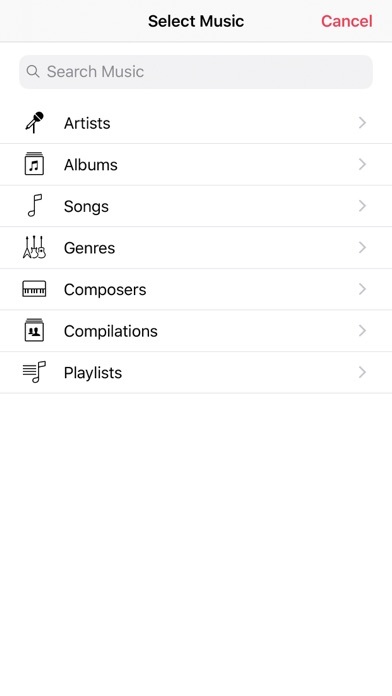 -Notes This app can not load DRM protected songs downloaded by music streaming service such as Apple Music and Spotify. Also, songs on iCloud can not be loaded. It is necessary to download it in advance.